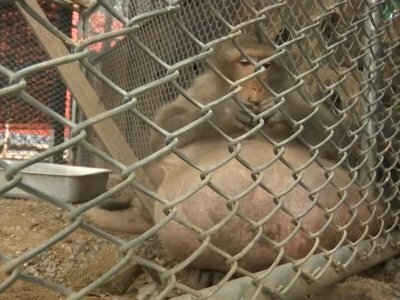 BANGKOK (AP) — A morbidly obese wild monkey who gorged himself on junk food and soda left behind by tourists has been rescued and placed on a strict diet of lean protein, fruits and vegetables. Wildlife officials caught the chunky monkey — nicknamed “Uncle Fat” by locals — after photos of the animal started circulating on social media last month. Wild monkeys roam free in many parts of Thailand, attracting tourists who feed and play with the animals. Most of the monkeys are macaques like Uncle Fat, and they typically weigh around 9 kilograms (20 pounds). Uncle Fat weighs three times that, tipping the scales at around 26 kilograms (60 pounds). The subordinate monkeys fed into Uncle Fat’s bad habits. “He had minions and other monkeys bringing food for him but he would also re-distribute it to younger monkeys,” said Supakarn Kaewchot, a veterinarian in charge of the monkey’s diet. Uncle Fat is believed to be between 10 and 15 years old. To help him lose weight, his new diet is limited to 400 grams worth of lean protein, fruits and vegetables twice a day. Supakarn said she hopes that within a few months they can consider releasing him to the wild. She said Uncle Fat is an example of why people shouldn’t feed wild monkeys unhealthy food.